We had a very quick trip up to catch up with GeeGee, Nana & Poppa this weekend, leaving at 7am Saturday morning to arrive by 12.30pm for lunch. We had a scrummy meal of pinwheel scones, hot cross buns, blueberry muffins and pikelets with maple syrup, a veritable feast put on by GeeGee as she always does. Then we headed to the Aquatic centre so Daddy, Noah and Poppa could take a dip and Noah could show off his newfound water confidence. 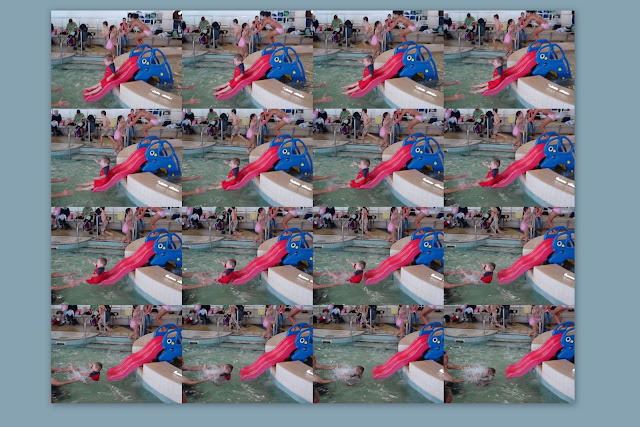 However, the big pool was quite noisy and not that warm so they quickly decided that the toddler pool and the warm soaking pool were the best place to be. Then it was back to Gee Gee's for a cuppa tea and a nice evening catching up with Great Nana and my cousin Gwyl who is due to go back to the UK in a month or so. 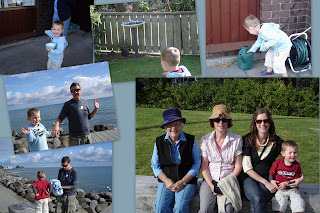 It is quite strange to think that right now Gwyl's parents Derek and Wendy will be staying the night with Grandma & Grandad in England, when less than 2 months ago we were all catching up together here in NZ at GeeGee's house. 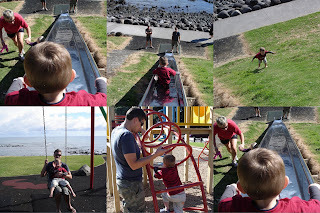 Sunday morning, we headed down to the beach for a walk along the walkway and then let Noah burn up some energy at the park alongside the aquatic centre. He even got brave enough to go down the really big metal slide (that would take a bit for me to even work up the courage to go down!). Lovely park, lovely scenery. We then headed to Fresha Cafe for a lovely brunch together, the food was just as good this time round as we had it when we went with Grandma & Grandad two months ago - and I must admit I didn't stray too far from the Thai Chicken Filo Tart since I knew how good it was! Then we packed up and shipped out - a very short and sweet visit. The trip home was uneventful (we stopped at our usual midway point the lake in Wanganui both up and back) and we were home and unpacked by 6.30ish. It helped our cause that the clocks went back overnight on Saturday night so we really were able to take advantage of our extra hour to pack a little more into the day. That being said, it always feels like winter is rapidly closing in when it's suddenly dark in the evenings. We have been investigating whole-house heating options, and at the moment some type of heat pump system appears to be the most efficient way to go. We are hoping we can get something installed relatively soon so that by the time the depths of winter are upon us, we will be tucked up cosy and warm in our little home. Sadly, our butterfly who we rescued from the imminent rain last week only lived another 24 hours and never did manage to fly. We were going to bury him last week but he seems quite happy to be currently standing (almost mummified if that's possible) on the kitchen bench for now. It has been a week of growth and movement on the baby front, as I have felt some definite movements for the past few days, which is a lot earlier than last time. I'm not sure if that's because the tummy grows faster 2nd time round or you know what it feels like so you know that's what the strange sensation is, or both! And I definitely feel like the tummy has had a bit of a growth spurt over the past week that's for sure. We are definitely looking forward to the next scan in 4 weeks time to see if baby will let us in on the secret of what flavour we are having. Having resigned myself to the fact that names were going to be pretty impossible this time round and we wouldn't be able to agree on anything, having spent a bit of time discussing it over the past week we do at least now have a few possibilities that haven't been immediately dismissed by one or other of us. So for now it's just a matter of wait and see! We can confirm that if it's a girl, it won't be called Petal Blossom Rainbow as I see Jamie Oliver's latest has been named!